I received an honor Thursday night, one that hit me out of the blue when Judy Stiles from Missouri Southern State University called in February to warn me that I was being inducted into the school’s Regional Media Hall of Fame. Photojournalist Bob Foos and I were feted with a banquet during which each of us was presented with proclamations full of whereases from the mayor of Joplin and a Missouri state senator, a hefty chunk of engraved glass, a color portrait, and gracious introductions lavish with praise from people who’ve known us for years. All we had to do was dress up at bit, enjoy the lovely meal, respond to our honors with some brief remarks, and allow ourselves to be interviewed on-camera by representatives of a couple of local TV stations. Oh, yes, there was this one other thing. They wanted a video from each of us highlighting our careers. Aside from being proud to have my portrait hung amid some august company, that’s the main reason I bring this up. I’ve spent four decades being, among other jobs, a photographer and video producer. In all that time, aside from a few historical projects which I created in the 80’s to support my mother’s book about her hometown, I haven't produced much that could be called personal. Wanting to tell a story starting with our move from Manhattan to southeast Kansas shortly after our wedding, I asked my wife for a few of our wedding pictures. She wasn’t sure where they are. 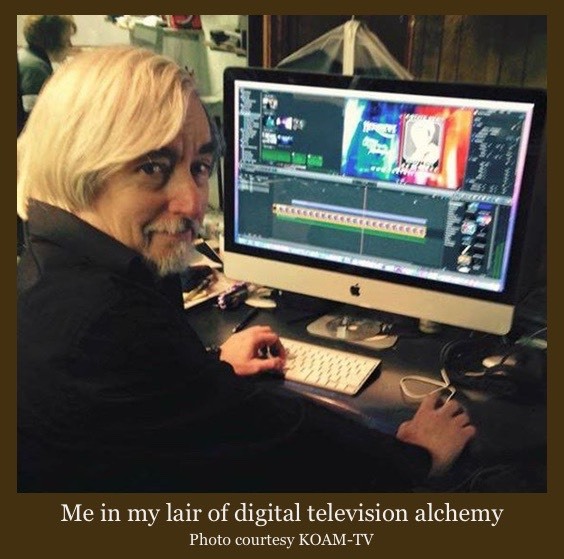 In the early years at KOAM my duties involved making pen-and-ink drawings for TV Guide ads and pastel art cards of our anchor team. Did I have any of those? Yes. Somewhere. There’s a notebook where I kept samples of work in case I suddenly had to throw together a resume, but that hasn’t turned up either. I finally did find an old and dilapidated portfolio in the garage with some usable pieces in it. And there was a photograph album with Polaroids from my days in radio, along with a tiny snapshot of Catherine in her wedding dress. What about video? Here, I caught a break. We change video formats every decade or so, and machines that are capable of playing the old tapes eventually break down. Luckily, a few years ago one of our engineers managed to massage an old one-inch reel-to-reel machine into working for as long as it took me to dub some videotape to a digital format, so I could rescue a handful of commercials from the 80’s, including three that featured my kids. It turned out to be enough. I made a 4-minute and 20-second video summarizing my “professional career” (I prefer to think of it as a steady job) that breezed right along, and which a few viewers said they found touching, although some of them might have come away with the notion that I only made commercial spots that featured dinosaurs and children. The struggle to get it made got me to thinking of the photograph album my father started in 1936 and which I only recently rediscovered. He purchased it with the best of intentions, wrote his name, age, height, weight, and hometown on the inside cover and pasted pictures of friends and family members on the sheafs of black filler paper, providing a brief description under each one in white ink. The captions are not always completely useful, unless cross-checked with other captions. For instance, there’s a photo of Dad’s sisters flanking a girl named Margaret. He labeled the picture “Sopha, Alice & Margaret,” the correct names but in no particular order. 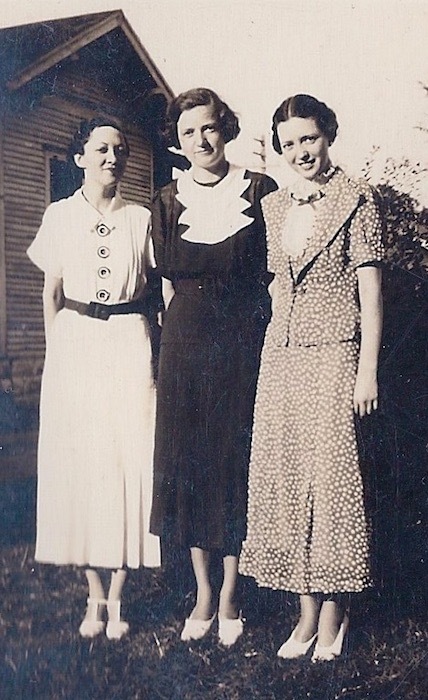 Alice is the one on the left, Sopha is on the right, and Margaret, the girl in the middle, was a mystery woman until I found another picture informing me that she was also Mrs. Carl Aspegren. The pictures are apparently mementos of a trip to Wichita for the Aspegren/Hendricks wedding. Margaret turns out to be a cousin of the two visiting girls, the former Margaret Hendricks, daughter of Ralph and Lulu (Switzer) Hendricks. 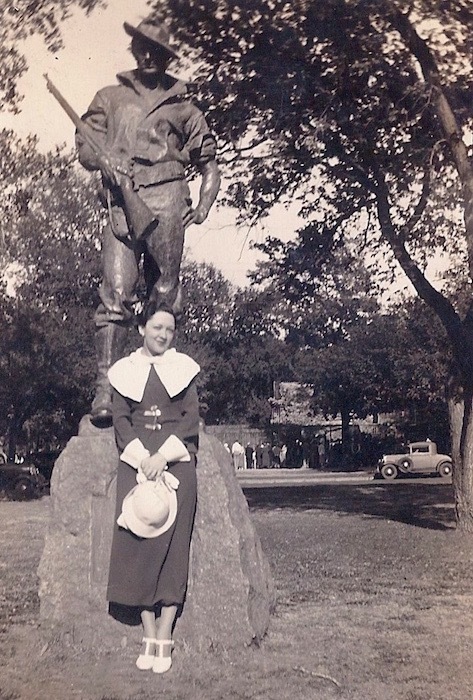 There’s also a shot of Alice Switzer in front of the Spanish American War Memorial in Riverside Park in Wichita. It seems oddly framed at first, but then I noticed that there’s an event going on behind her. My dad and his sister may have crept away from a wedding reception which we can just barely glimpse, to grab a photo-op in the park. On the right, there’s Alice again, standing next to a young lady identified as Doris Shaver, two gals on a shopping quest, Alice wearing the same dress she wore in another photo, suggesting that they were taken on the same day. The picture on the sidewalk may be my favorite, not only because the subjects are so expressive (Alice having perfected Mae West's off-camber glance), but because it was taken in front of a now-defunct Dockum Drug Co. store. I wish there were others like this one, including more scenes of local culture. Dad could have done me a favor by explaining the story behind these photographs. On the other hand, would I have found them so irresistible if there were no mystery involved - nothing to discover on my own? At least he left me a few clues, and that’s more than we usually have.